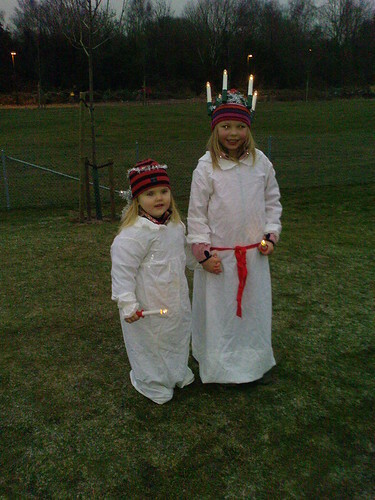 Today it's Lucia-day and all over Sweden parents are choking back tears as their little ones sing and celebrate Lucia. We're invited to my littlelest one's daycare at 3:30 pm for an outdoor celebration. They combine the celebrations of all three units and parents and relatives are invited to come watch and listen. 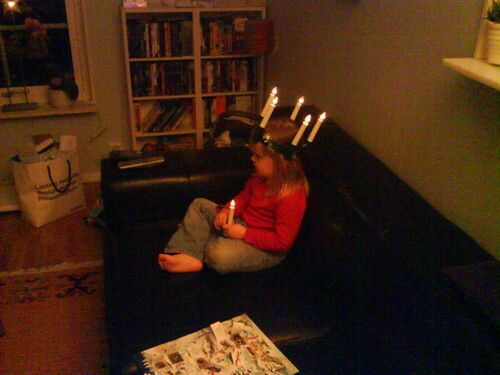 After the kids are done we're invited to stay and have some fika, but we have to bring it ourselves. Since we live so close to the school we usually walk home afterwards and do fika at home. This year the girls' grandparents (my in-laws) are joining us for dinner at home. I'll post pictures tomorrow or maybe later tonight, but here are two from last year. Both girls were there then. This year my oldest is in school and won't be joining her sister.